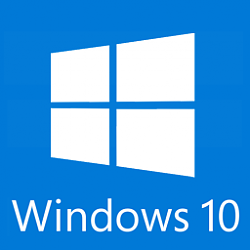 By default to get the free Windows 10 offer, you would normally need to upgrade to Windows 10 on your activated Window 7 or Windows 8.1 PC to register the activation of Windows 10 for your PC on Microsoft's activation servers. Afterwards, you would be able to clean install Windows 10 on the PC anytime, and have Windows 10 automatically activated. This tutorial will show you how to directly clean install Windows 10 on your activated Window 7 or Windows 8.1 PC without having to upgrade first, and have Windows 10 legally activated afterwards. This will help show you what edition of Windows 10 USB or ISO you need based on what edition your current Windows 7 or Windows 8/8.1 PC is. If you haven’t upgraded to Windows 10 yet and perform a clean installation, you’ll need to enter a qualifying product key for Windows 7, Windows 8.1 or Windows 10 or buy a license in order to activate Windows 10. 1. Do step 2 (USB) or step 3 (ISO) below for what type of Windows 10 installation media you want to use. 2. Create a Windows 10 USB that is for the same type (32-bit or 64-bit), edition, and language as your current Windows 7/8.1, connect and open the USB in your activated Windows 7/8.1 PC, and go to step 4 below. 3. Download a Windows 10 ISO file that is for the same type (32-bit or 64-bit), edition, and language as your current Windows 7/8.1, mount the ISO file in your activated Windows 7/8.1 PC, and go to step 4 below. You must copy the gatherosstate.exe file to your desktop. If you do step 5 below directly from the sources folder location instead of from your desktop, it will not work. 5. Right click or press and hold on the gatherosstate.exe file on your desktop, and click/tap on Run as administrator. This will create a GenuineTicket.xml file on your desktop. The Windows you are currently running must be activated to be able to create a GenuineTicket.xml file. 6. Copy the GenuineTicket.xml file to a USB or another drive than your Windows drive as a backup. You will need this GenuineTicket.xml file later to activate Windows 10 with. 8. When Windows 10 is finished installing, open File Explorer, copy and paste the folder path below into the address bar, and press Enter to open the GenuineTicket folder. The GenuineTicket.xml file can only be used on the PC it was originally created on. 11. Restart the computer to apply. I'm going to give this one a workout for sure! One thing I did when browsing to the GenuineTicket folder for the present install was an empty folder since the clean install followed an upgrade. I suspect that would be the reason for that. Shawn always does a great job on the guides! :) I still have that other 7 Pro case to look at there where this will be a time saver from a second drive's temp install or clone and the upgrade only to be followed by the clean install to come afterwards. Would this method also work on a system already running windows 10 Pro, that was upgraded from windows 10 home?? Just wondering if I could use this method to do a clean install of Win 10 Pro. This computer came with Windows 8 home edition, then by the original owner was upgraded to win 10 home. Then I upgraded this computer to Windows 10 Pro, with a bought key. Its never really had a clean install. Since you have a product key for Windows 10 Pro, you should be able to do a normal clean install, and enter the Pro key during Windows setup. If it doesn't activate for some reason, you could activate by phone instead. - and delete the whole partition and make new one, just for 10 pro. and activated with genuine ticket? Last edited by bayustev; 25 Sep 2015 at 08:59. Yes, you can use this method as well to clean install. It's mostly for those that would prefer to clean install to the free Windows 10 offer first instead of having to upgrade to the free Windows 10 though. However, since you have already upgraded to Windows 10 Pro on the activated Windows 8 Pro PC, you will be able to clean install normally on the PC and have Windows 10 Pro activated afterwards. Just be sure to "skip" entering a product key during Windows Setup. and succesfully activated online using genuine.xml. -and really clean without any trace from previous driver. Last edited by bayustev; 25 Sep 2015 at 10:33.